In Canada, providing clean winter water for cattle is a challenge in cold weather, especially in regions without electricity for running a pump or tank heaters. In the past, livestock were turned out to summer	pasture and allowed to walk through and drink from any slough, creek, river, or lake available to them. In the winter, livestock either ate snow, or holes were cut in the ice of these natural water sources for them to drink from. When these natural water sources were not available, dugouts were constructed. Today, allowing livestock direct access to surface water sources is a concern to livestock producers and to other water users. The practice is also a problem for livestock. Livestock producers want to provide a safe, reliable supply of good quality water for their livestock, and they want to increase their management to better utilise their pastures for livestock production. Many producers are using remote water systems and applying the latest technology available for extended livestock grazing and winter feeding of livestock away from the farmyard. Livestock producers, like other water users, want to do their part to protect both natural and constructed water sources from environmental damage and to address herd health problems. Dugouts, simply a hole dug and filled with rain water with slope for cattle to be able to go inside and drink, have been the conventional outdoor method for watering cattle in pastures. The challenge in most northern part of Canada is that dugouts can freeze in winter and can accumulate bacteria and disease especially with shallow slope dugouts where cows can go bath inside. damage to banks of streams and dugouts, siltation problems in spawning areas for fish, loss of riparian habitat and vegetation, loss of water storage in dugouts and streams, nutrient buildup in both the source and downstream water bodies, rapid growth of weeds and algae and deterioration in water quality. HA number of herd health problems are related to direct watering: increased exposure to water-transmitted diseases, bacteria, viruses and cyst infections, blue-green algae (cyanobacteria) toxins, foot rot leg injuries, stress, death by drowning from falling through the ice or being stuck in mud, reduced rates of gain, overgrazing near the water source and poor nutrient transfer caused by an accumulation of manure in the area near the water source. Both poor access to water and poor water quality can affect livestock behaviour and production on pasture. In a pasture trial, however, it is extremely difficult to isolate what, how and when these factors become significant because there are so many variables in the cattle, the pasture grass, the water source and the water quality. Some pasture studies have shown a significant increase in cattle production where water was pumped to them versus direct watering from dugouts. Other studies have shown little or no improvement in cattle production. However, the studies have all shown that cattle prefer to have good quality water be pumped to them instead of direct watering from a dugout. There are many benefits to pumping water to cattle and keeping them out of water sources and emerging solar energy has given Canadian Farmers the tool for that: Solar Watering for cattle in remote off-grid remote pasture is keeping away cattle from contaminating surface water and providing fresh water for cattle away from dugouts. For remote dugout locations, watering systems must be durable and able to withstand temperatures that drop to -40°C. Most winter watering systems available on the market today have a common set-up. The main components are an intake water line from the dugout, wet well, power source and pump (Watering bowl with a drain-back system). The most common pumping systems currently being used during the winter are solar-powered. The solar panels are used to charge batteries that supply electrical power for running a pump. Two basic design concepts prevent freezing: a well insulated trough system or a drain-back system. solar panels, deep cycle batteries, battery charge controls, pump, a motion detector or float switch to start and stop the pump , water lines, a watering bowl or water trough, other options including a wind turbine to supply additional power for the batteries during extended cloudy periods and an aerator to improve dugout water quality. The solar-powered system pumps water from the wet well into an insulated, doughnut-shaped trough. The float switch signals the pump when the water level is low to keep the trough full. 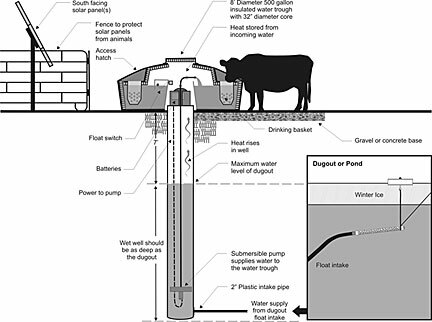 Livestock drink water through access hatches in a fitted, insulated lid that sits on top of the wet well. The trough has several access hatches that can be opened for larger herds. On extremely cold nights, all but one of the access hatches may have to be covered to prevent heat loss and freezing. This system relies on the heat stored in the incoming water to keep it from freezing and thus must have a minimum number of livestock drinking from it each day during freezing temperatures. This system is shown in Figure 10. This system is set up directly over the wet well beside the dugout and uses a motion sensor to activate the solar-powered pump. The motion sensor starts the pump when livestock approach the watering bowl to drink. Water is pumped into the bottom of a 25 inch (63.5 cm) diameter round watering bowl located on top of a 24 inch (60.96 cm) diameter culvert or wet well. The water level rises in the bowl to a set of overflow holes that return excess water back into the wet well. These holes are located near the top edge of the bowl to prevent overflow onto the ground. The pump will run as long as there is livestock motion within the range of the motion detector. To prevent the pump from starting and stopping, a delay is built in to allow the pump to continue running for a pre-set time. This delay allows the next animal to approach the watering bowl and get water before the pump shuts off. Water remaining in the bowl drains back to the wet well through the bottom of the bowl so that no water remains in the bowl to freeze. Motion detection systems are adaptable to a variety of setup configurations as shown in Figure 9. The ground level at the watering bowl site should be at least 7 feet (2.13 m) higher than the maximum water level of the dugout. This amount of soil cover will prevent frost penetration and freezing of the water in the wet well. Slope the site away to provide good drainage to ensure a dry, clean, safe watering site during mild thaw events. 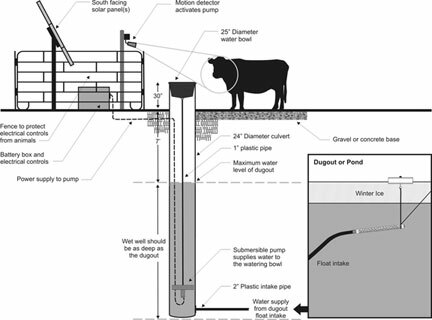 No matter the size of a livestock watering system, proper planning and sustainable design play an important role in its effectiveness. Good installation cannot compensate for an inadequate water source. Good quality water and sufficient quantity are both vital to livestock. Solar livestock watering systems are an important tool in protecting water sources and livestock and consequently providing higher quality meet and diary products. Hello Peyton Paul. Energy is stored in batteries installed underneath Solar PV Panels. Hello Rayhaan Hall. You need to provide a couple of days for the setup (assuming existing dugout). Typical capacity is one water bowl per cow. the more bowl the longer it takes. Hello Bilal Foreman. You’re absolutely right. the best combination will be Wind Turbine and a solar PV Panel and batteries for energy storage. Solar will provide electricity in sunny hours and at windy nights or non sunny days, PV panel will provide power. This does not look too complicated! While it is more work than the traditional dugout, the well insulated trough system and brain-back system both look effective. How long does it take to setup one of these systems alone? How many cows can use it at once? Thanks for sharing this.